Crew equipments are reflected on Rose's TV. A strip of desert is visible between the dock and the Titanic when docked at Southampton. Rose's paintings include Picasso's "Les Demoiselles d'Avigon", one of the ballerinas series by Degas, and "Water Lilles" by Claude Monet, none of which were ever on Titanic. Jack claims to have gone ice fishing on Lake Wissota. However, Lake Wissota wasn't created until five years after the Titanic sank. Jack claims to have visited the Santa Monica Pier, which did not begin construction until after 1916. The pipe frames supporting the third class berths have set-screw speed rail fittings, not developed until 1946. Maragret Brown was never refered to as "Molly" until after her death. In the scene where Jack is teaching Rose to spit, there is no spit on his chin as he starts to turn around to face the ladies, but by the time he has completed his turn he has some on his chin. The paintings over the fireplace in the Titanic's first class smoking lounge in the film depicts New York Harbor, which was actually the painting on the Titanic's sister ship, "Olympic". The painter, Norman Wilkinson, had provided a scene of Plymouth Harbor, but no pictures of this work survive. A closeup of Captain Smith reveals that he is wearing contact lenses. 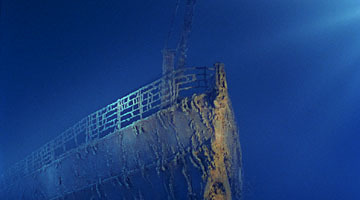 While Jack and Rose are walking on the promenade the day after he rescues her, a small hill with a building on it is visible over Jack's shoulder and above the ship. Jack takes Rose and Molly's arms to go into dinner.They start walking, but in the next shot they are still standing apart. "Almighty Father Strong To Save" is sung during the worship service; the two verses used in the film were written by Robert Nelson Spencer in 1937. The length of Rose's fingernails change throughout the movie!